Without fancy design and 5-star hotel facilities, Culture Hotels, dedicated to capturing the cultural spirit of the destination, are developed with the concept of combining conventional hotel services with elements from our cultural heritage. Some of them have witnessed the tides of history and therefore have their unique stories to tell. A stay at one of these heritage properties is just like travelling back in time, allowing you to experience and trace the traditional living taste. With over 20 years of hotel management experience, Silk Road Hotel Management Company Limited has been striving to provide unique accommodation experience to guests from around the world. The flagship property of the Group is The Silk Road Dunhuang Hotel, in spectacular Han and Tang architectural style and a showcase property built against the backdrop of the rolling sand dunes. 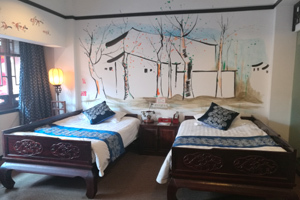 In Huangshan, Tunxi Lodge is set at the ancient commercial street of Song, Ming, and Qing dynasties for you to trace the footprints of the ancient Hui merchants. Whether it is our own Culture Hotels or hotel partners, each Culture Hotel takes in the best of regional culture, from the past and present, to ensure guests to have an enriching and enlightening stay. We will continue to explore unique Culture Hotels for our culture and travel lovers. As a culture lover, we thank you for choosing to stay and sharing your cultural norm with us. Your stay with us is a kind of recognition to our effort on preserving our invaluable heritage which can be passed on to our future generations through sustainable development. To restore the old for new and to retain its authentic cultural flavour can be a dilemma. Therefore, each Culture Hotel is carefully designed and furnished. Little is known about the running of a Culture Hotel, particularly for those historic properties. Here, we unveil the mysterious side of Culture Hotels. In a typical Culture Hotel, usually, there are less than 60 guestrooms. Due to the fact that the architecture of some historic buildings cannot be altered, the size of each guestroom may vary from one to another. Interestingly a small guestroom does not necessarily mean that the room rate is lower than that in a 5-star hotel. For those hotel properties which are historic buildings, they are normally under state protection or supervision from a government preservation unit. At an initial restoration stage, the biggest challenge is that it usually takes longer time to strike a balance between restoring the property to its indigenous look and condition which is good for hospitality purpose and demolishing the old for new. On the other hand, in order to comply with the local preservation rules, the renovation cost for a heritage property is usually higher than a non-heritage property. For example, new nails cannot be put into the wall or doors of a heritage property; if a wall leaks when it rains, special repair works need to be done according to the instructions of the preservation unit so that the initial architecture of the property will not be damaged, which usually leads to a high maintenance cost. Although the cost of running a Culture Hotel is very high, especially for a historic property, the cultural content that it carries is an invaluable heritage to our future generations. The birth of a Culture Hotel is not just one of the ways to preserve the property for sustainable development, but also to provide job opportunities and improve the local economy. A stay at a Culture Hotel is not just a pursuit of cultural experience, but also a witness to the passing-on of the cultural heritage. 1. For those historic buildings which are under heritage protection, their architectures cannot be altered and therefore, the walls may not be sound-proof. Try not to make big noise during your stay. 2. Cracking sound of the wooden doors or floor dated back to hundreds of years can be heard once in a while. 3. Hot water comes in slowly particularly during winter. Therefore, before you take shower, please check if hot water comes quickly. If not, please let the water run for at least 5 minutes to allow hot water to come. 4. Usually there is no central heating, but most of the hotels have installed good in-room heating system to keep you warm in winter. 5. Some of the Culture Hotels are furnished with antiques. We appreciate your help on keeping them in good condition while in use. 6. The location is a bit difficult to find? Think about it, some of these heritage properties were once the former residence of a royal family or nobles. The location of the residence revealed the social status of the owner during that time.